WHERE CAN I GET A CUSTOM MOLD MADE? CAN THE MOLD BE FILLED BY MULTIPLE PULLS OF THE HANDLE? ⇨NO, that is not possible with ANY machine. Every plastic injection machine has a maximum amount of plastic (shot size) than it can inject into a mold. ⇨If the volume of the mold is larger than the machine's shot size, you need to purchase a larger machine. ⇨Once you determine the volume of plastic needed to fill your mold, you then can select a machine that is able to inject (at least) that same volume of plastic. 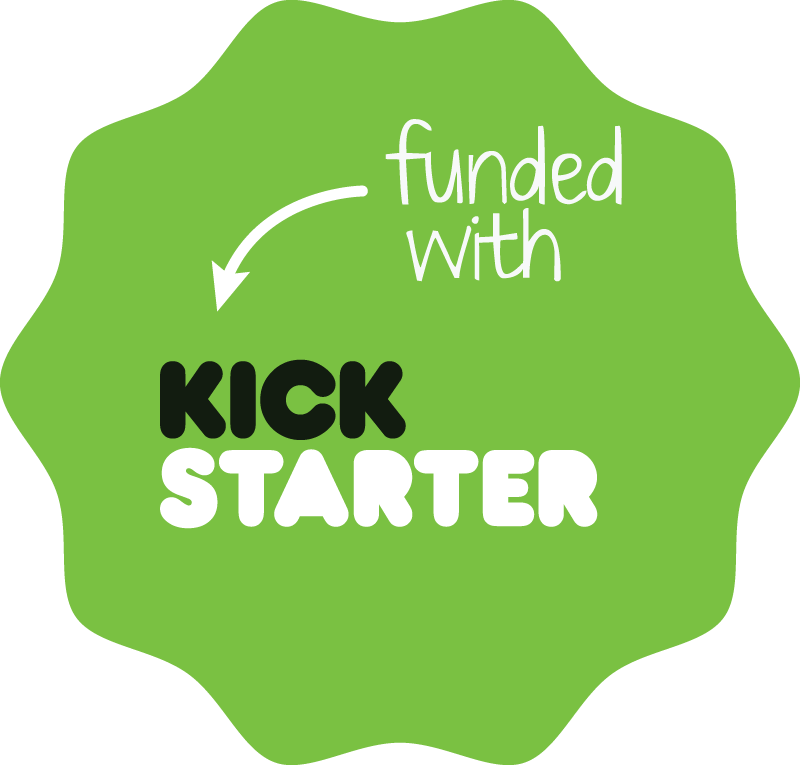 ⇨Your mold maker or CNC software can tell you the volume of plastic needed to fill your mold. WHAT ARE THE CAPACITIES OF THE DIFFERENT MACHINES? ⇨The Model 20A has been DISCONTINUED. ⇨The Model 150A can reach 500 deg.F and can inject up to 1.1 cubic inches of plastic or 18 grams (shot size). ⇨The Model 150A weighs 70 lbs and ships in a wood crate. The dimensions of the crate are 19 inches x 13 inches x 24 inches tall. WHAT ARE THE MAXIMIUM OUTSIDE DIMENSIONS OF A MOLD FOR THE MODEL 150A? ⇨NOTE: We do NOT manufacture molds. 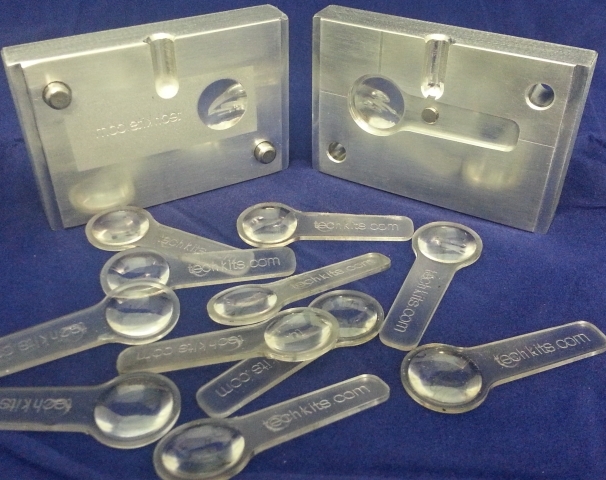 See above for partners that can make custom molds for our machine. ⇨The Model 150A can accept molds up to 8 inches wide x 5 inches tall x 5 inches deep. ⇨The sprue hole in the top of the mold should be 1/4 inch diameter to mate with the nozzle. CAN RECYCLED PLASTIC BE USED IN THESE MACHINES? ⇨Rejected molded parts or scrap can be cut into small pieces and placed back into the barrel. ⇨Also, clean recycled LDPE or PP plastics (but not PET or PETE) can be cut into small strips and used in this machine. WHY ARE NYLON, POLYCARBONATE, PET AND PVC MATERIALS UNSUITABLE FOR THESE MACHINES? ⇨Polycarbonate and PET plastics typically require high melting temperatures above 500 deg F. for injection. ⇨Due to the unique properties of Nylon, we have been UNABLE to get it to work in our machines. IMPORTANT NOTE: Attempting to use Nylon in this machine will VOID both the warranty and the return policy! ⇨PVC plastic can emit TOXIC vapors when heated and PVC can corrode the steel parts of the machine. IMPORTANT NOTE: Attempting to use PVC in this machine will VOID both the warranty and the return policy! WHERE CAN LARGER QUANTITIES OF PELLETS BE PURCHASED? ⇨Premier Plastic Resins can supply many types of thermoplastic pellets in 55 lb boxes. Click on the LOGO below to view their website. ⇨Each batch of thermoplastic polymer has a Melt Flow Index (MFI) or Melt Flow Rate (MFR) value. The MFI or MFR is a measure of how easily the material will flow when melted. Plastic pellets with a high MFI value will be much easier to inject than the same type of pellets with a low MFI value. Note: All the pellets sold on our webpage have a high MFI value and have been tested to work in our machines. If you purchase pellets from another source, be sure they have a high (greater than 12) MFI value. ⇨Also, the recommended temperatures for a polymer should be used only as a starting point. If the material does not flow, then gradually increase the temperature setting in 5 to 10 degree increments until you get satisfactory results. Note: the temperature is TOO HIGH if the material from the nozzle is discolored, emits fumes or contains gas bubbles. DO I HAVE TO PURGE THE PLASTIC FROM THE MACHINE BEFORE TURNING IT OFF? ⇨Purging is NOT required - The machine can be turned off with plastic material still in the barrel. The plastic material in the barrel will re-melt when the machine is turned back on. ⇨Purging is only necessary when changing colors or types of materials. CAN I CREATE A NEW COLOR BY ADDING 2 DIFFERENT COLOR PELLETS INTO THE MACHINE? ⇨The colors will NOT mix uniformly to create a new color (see photo below). Instead, they create beautiful randomly swirled patterns! 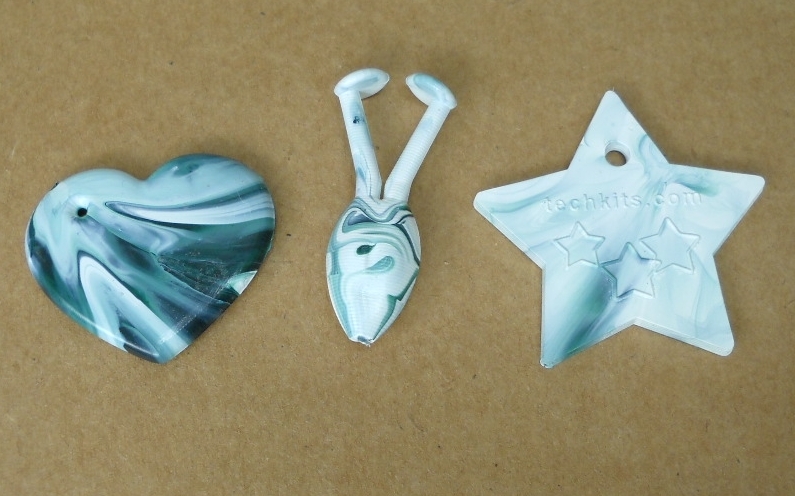 The swirled colors will also happen during the switch-over (or purging) to a new material. 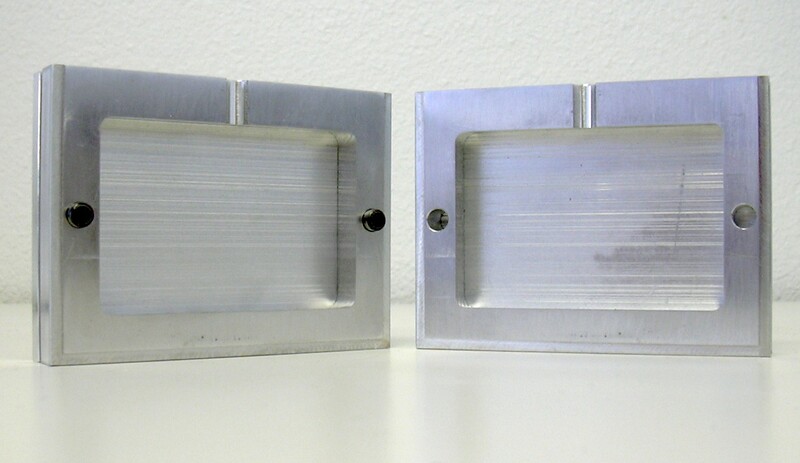 CAN I USE 3D PRINTED MOLDS FOR PLASTIC INJECTION? ⇨YES! 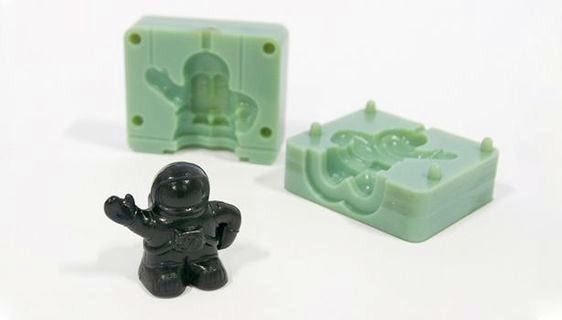 - 3D printed molds can be used (see photo below). However since you will be injecting melted plastic into a plastic mold, precautions must be taked to avoid damaging or melting the 3D mold. You should use a method to prevent the machine's hot nozzle from directly contacting the 3D printed mold. 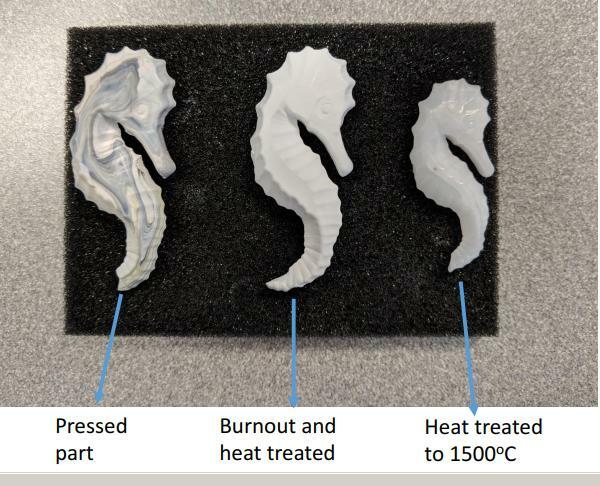 You also need to cool the 3D printed mold after each injection to avoid heat build-up. CAN I USE SILICONE OR RUBBER MOLDS FOR PLASTIC INJECTION? ⇨YES! - Rubber or silicone molds can be used (see photo below). However since the injection machine can exert over a thousand pounds of pressure during injection, you must take special precautions. 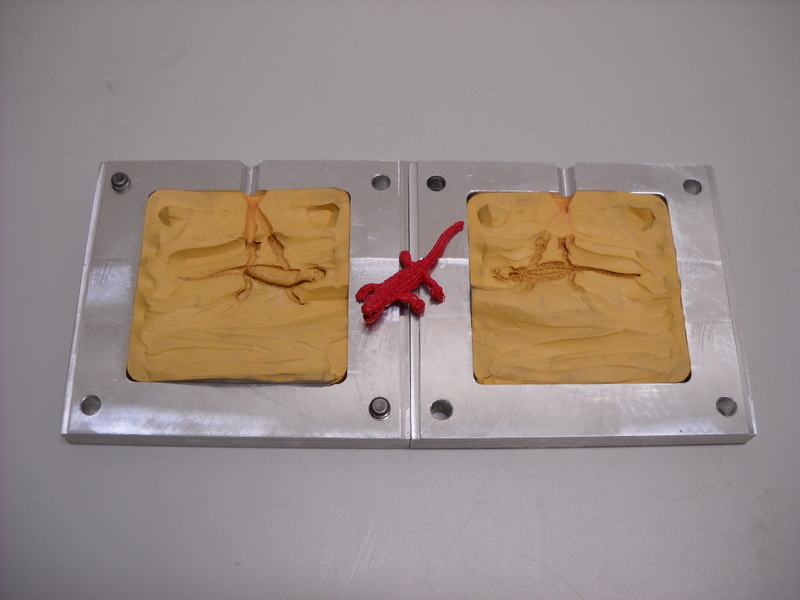 Placing the rubber or silicone mold into a metal frame is recommended. This will prevent the machine's nozzle from deforming the mold. It also keeps the mold from expanding when the plastic enters under high pressure. 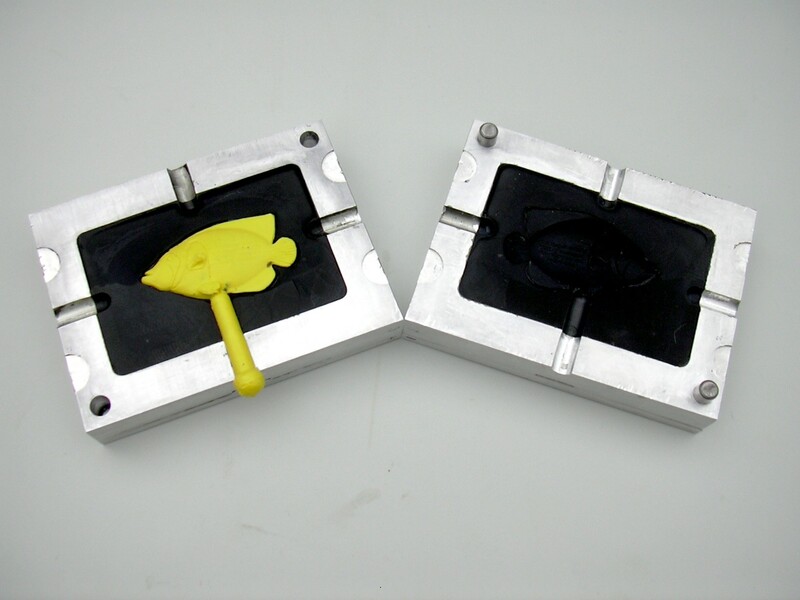 CAN I USE EPOXY MOLDS FOR PLASTIC INJECTION? ⇨YES! - Epoxy molds can be used to reproduce Figurines or Action Figures, etc. (see photos below). CAN THE MODEL 150A PRODUCE OPTICALLY CLEAR PARTS? ⇨YES! - Injection grade plastics (M30 Acrylics, Eastman Tenite, etc) will work in the Model 150A. (see photo below). CAN THE MODEL 150A work with Ceramic Injection Molding (CIM)? ⇨Looks Possible! We are currently working with a dental laboratory to test molding Ceramic Injection Molding (CIM) parts with the Model 150A machine. (see photo below). WHAT IS THE BEST WAY TO PRE-HEAT THE MOLDS (IF NEEDED)? 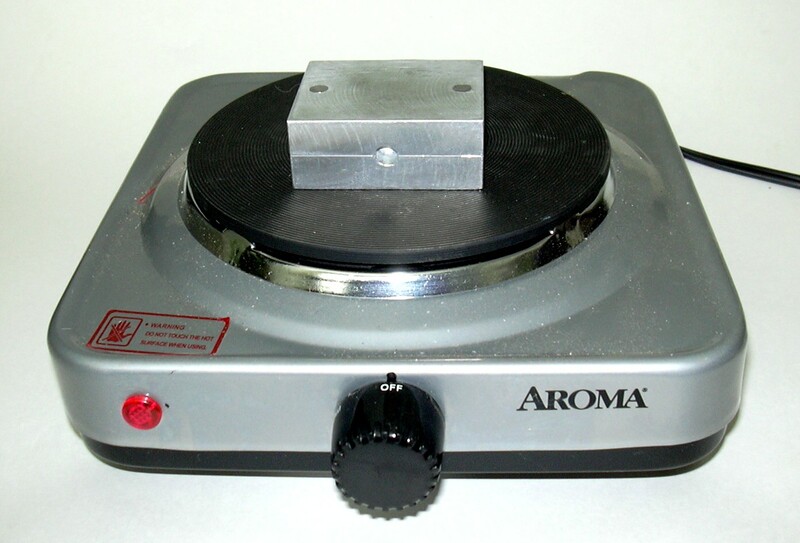 ⇨A simple, economical & repeatable way to pre-heat the mold is to use a hot plate with adjustable temperature settings (see photo below). Using protective gloves, place the mold flat on the hot plate for a fixed time or use a thermometer to determine a more precise pre-heat temperature. ⇨Alternatively, a hair dryer or hot air gun can be used to pre-heat the mold by blowing hot air onto it. ⇨LNS Technologies has partnered with MyUS.com to offer convenient International Shipping. MyUS.com membership can offer you deeply discounted international shipping rates for shipping to more than 225 countries. They can provide you with a US street address, receive packages on your behalf, and then ship your order overseas. MyUS.com also helps prepare customs paperwork for your shipments. You must contact the Freight Forwarder for prices and delivery options to your country. ⇨Alternatively, Freight Forwarder - USGoBuy makes shopping at any USA online stores easy with their ShipForMe service!